The 34-year-old Smith, who ranks 19th in league history in receptions, was released Thursday by the Carolina Panthers after 13 seasons. "[Baltimore] has been an organization with a history of giving veteran players a chance and meshing them with younger players," Smith said on a conference call Friday. Smith arrived in Baltimore late Thursday night, and negotiations and meetings continued into the early morning hours Friday. Smith said he had a contract offer from the San Diego Chargers and canceled a visit with the New England Patriots scheduled for Monday. Smith added that the Washington Redskins and Seattle Seahawks also expressed interest. One of the reasons he chose Baltimore, he noted, is because it's about a one-hour flight to Charlotte, where his family will continue to live. Smith's wife, Angie, is expecting their fourth child later this year. 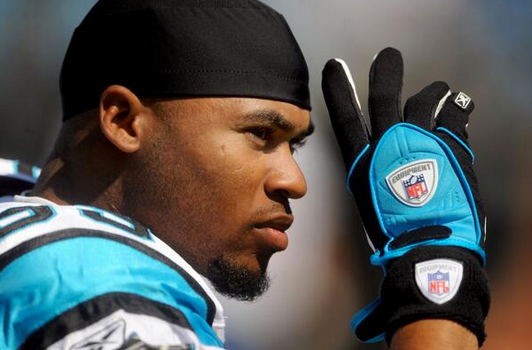 Smith caught 64 passes for 746 yards with four touchdowns in 2013, helping Carolina capture the NFC South title. He is the Panthers' all-time leader in catches (836), receiving yards (12,197) and touchdowns (67). He should provide a solid weapon for quarterback Joe Flacco. Baltimore has had a void at wide receiver since trading Anquan Boldin to the San Francisco 49ers after winning the Super Bowl in February 2013. The Ravens went 8-8 last season and missed the playoffs for the first time in six years. "We have added one of the top competitors in the NFL to the Ravens," Ravens general manager Ozzie Newsome said in a statement. "He's a proven player who has performed the best in big games and biggest situations. He adds toughness to our offense." The Ravens will play the Panthers in 2014 in Baltimore, something Smith clearly is looking forward to. He told Charlotte-based radio station WFNZ-AM on Wednesday that fans will need to wear goggles because there will "blood and guts everywhere" on the field when he plays the Panthers. He backed off those comments Friday, saying it was a tongue-in-cheek statement. "It wasn't that I don't like the organization," Smith said. "I have nothing but respect. My teammates have been telling how much they are going to miss me. I have no ill feelings, and I'm not upset. I can't be upset at an organization that gave me everything and allowed me to display for other teams that I can still play." Smith said he's excited about the Ravens' offense, calling it a good fit. He also made it clear he no longer views himself as a No. 1 receiver, instead seeing himself as a player comparable to Kevin Walter, who played under new Ravens offensive coordinator Gary Kubiak with the Houston Texans. Smith has wanted to play in the slot for the past few years and could get that chance in Baltimore. "I know this system and seen the very creative ways they have gotten guys the ball, and I want to be a part of that," Smith said. Smith has never won a Super Bowl. "We're going to swing for the fence," Smith said. "But chasing a ring and making it about all those other things, you can't do that." Ravens coach John Harbaugh called Smith a "Ravens-style player."